My nail posts have been quite a rare sight recently. Compared to the two consecutive months of nail art challenges, (did I really do that?? ), my nails haven't been a priority, although they are always painted! Some time ago, I received a lovely e-mail from Lisa at nail-art-101 asking if I'd like to do a guest tutorial. Needless to say, I was excited and extremely flattered to be asked. I found it hard choosing something to do for all skill levels, especially as it was for someone else. A gentle nudge from Lisa brought us to stamping......... I'm not sure wether this one or another I submitted will be chosen. Since we are in the middle of the British summer, I thought neons couldn't really go wrong. 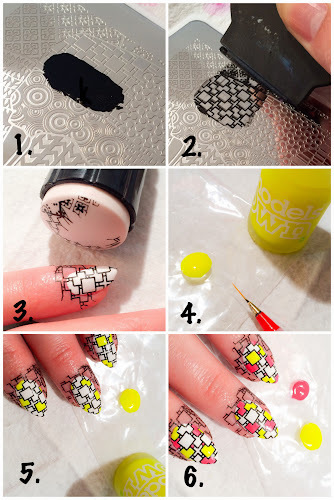 All you need is a stamp design (or freehand the design with a nail art pen), various neon polishes and a small detail brush or dotting tool (even a cocktail stick). Begin with a base mani of white which really makes the neon polish pop. 1. Apply black polish to the design plate, I used MoYou Artist Collection 04. 2. Use the scraper to press and sweep across the plate, spreading the polish over the design. 3. Press the stamper onto the design plate to lift the image, then immediately press it onto the nail. Do this for all the nails. 4. Take a blob of polish and put it on a palette. A plastic bag worgs great as you can throw it away after you are done. 5. 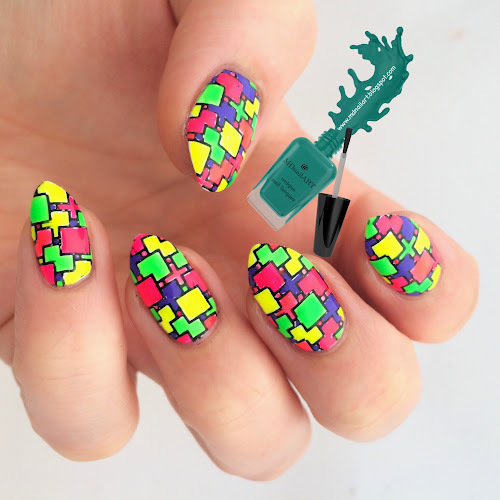 Select random squares from each nail and begin painting them with your first colour. Complete all the nails. 6. Then continue working on the next colour, then the next, until you have no more white exposed. Finish by cleaning off the polish on the skin with an angled make up brush and acetone, then brush on some top coat to seal in the design and you're done! The finished look really does pop in the sunshine, and the method is so much easier and faster than doing the decal method.